High adventure among the stars. 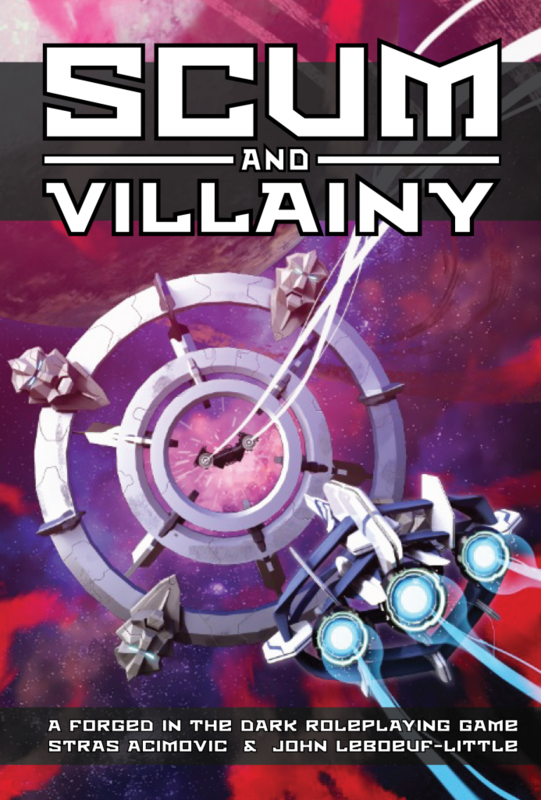 Scum and Villainy is a Forged in the Dark game about a spaceship crew trying to make ends meet under the iron-fisted rule of the Galactic Hegemony. Work with the members of your crew to thrive despite powerful criminal syndicates, warring noble families, dangerous aliens, and strange mystics. Explore the ruins of lost civilizations for fun and profit. Can your motley crew hold it together long enough to strike it big and insure your fame across the sector? A clear gameplay structure that puts the focus on the criminal undertakings of the crew. A session of play consists of a job followed by recovery, downtime projects, and advancement. Ship “character sheets” that allow for XP spends, upgrades, and leveling up alongside your characters. Crew advancement opportunities to reflect the change from a ragtag group barely flying in the black to a reputed crew that has built a name across the sector. MAY YOUR SHIP FLY TRUE, AND YOUR BLASTERS NEVER JAM.